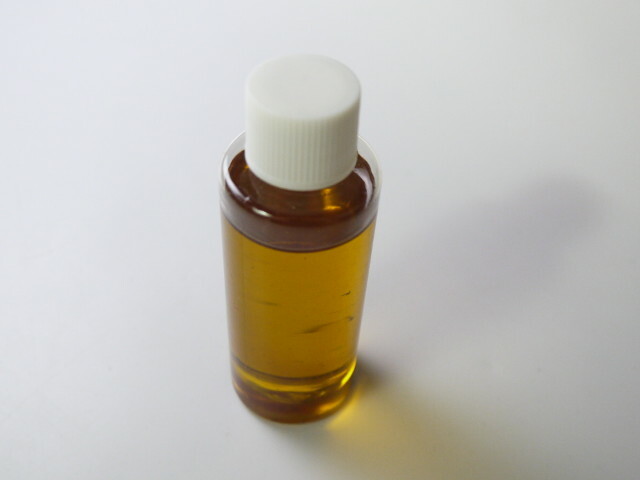 I have described how to make St. John's Wort oil in an earlier article (../st-johns-wort/). Comfrey leaves contain a lot of water and you have to dry them first otherwise you will get mold growing. Comfrey is ready to harvest at the beginning of summer while Calendula is typically flowering at the end of summer or in autumn. Comfrey is very easy to grow and the plants are big. 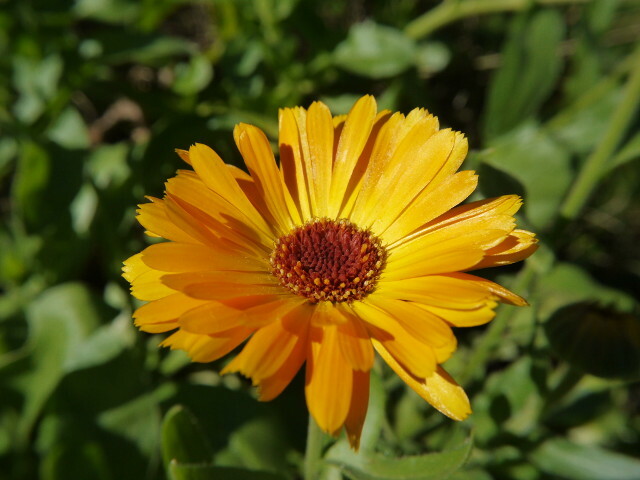 Calendula will not seem to grow much until the summer is almost over. It wants a sunny spot but the soil should not be dry. At the end of summer it will suddenly have a lot of very beautiful flowers. 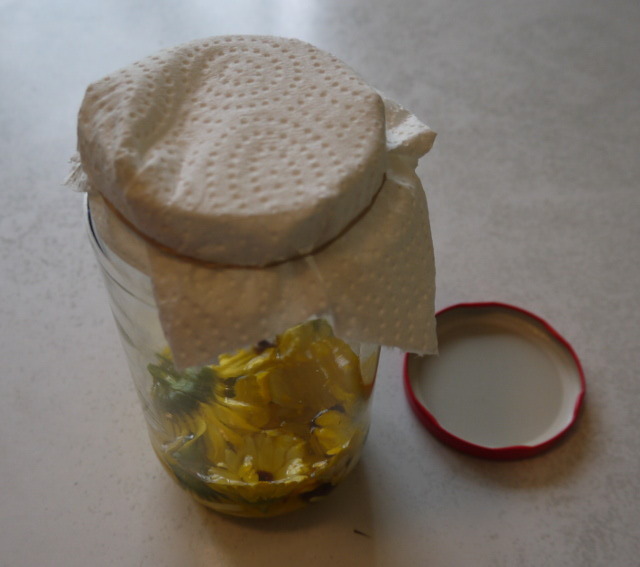 Harvest a hand full of fresh Calendula flowers and put them into a jar, add sunflower oil and cover the jar with a cloth. In a pot get water to simmer and then put the jar into the pot and let it simmer for 2 hours. After that you let it cool down. 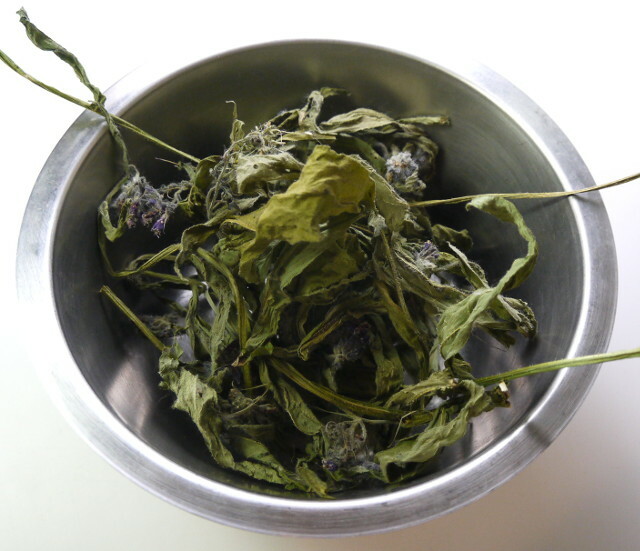 The next day you take the flowers out of the oil and you add dried Comfrey leaves. You can cut the leaves with a knife into small pieces. Keep the dried comfrey in the oil for about a month then strain the oil and add a bit of St. John's Wort oil. The oil is now ready for use. You can keep it for about 2 years after that it will start to get rancid and you should not use it anymore. To turn the oil into a salve you warm it up and add a bit of bee's wax. The oil and salve have antiseptic as well as soothing and healing properties. It is excellent for irritated baby skin.